Small Beer Press, 9781618730695, 300pp. Jonathan Edwards is considered America's most brilliant theologian. He was also a slave owner. This is the story of the years he spent preaching in eighteenth century Northampton, Massachusetts. 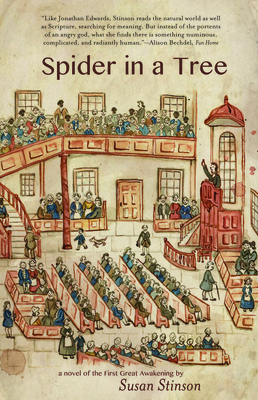 In his famous sermon -Sinners in the Hands of an Angry God, - Edwards compared a person dangling a spider over a hearth to God holding a sinner over the fires of hell. Here, spiders and insects preach back. No voice drowns out all others: Leah, a young West African woman enslaved in the Edwards household; Edwards's young cousins Joseph and Elisha, whose father kills himself in fear for his soul; and Sarah, Edwards's wife, who is visited by ecstasy. Ordinary grace, human failings, and extraordinary convictions combine in unexpected ways to animate this New England tale. Susan Stinson is the author of three novels and a collection of poetry and lyric essays and was awarded the Lambda Literary Foundation's Outstanding Mid-Career Novelist Prize. Writer in Residence at Forbes Library in Northampton, Massachusetts, she is also an editor and writing coach. Susan Stinson: Susan Stinson is the author of three novels and a collection of poetry and lyric essays. In 2011, she was awarded the Lambda Literary Foundation's Outstanding Mid-Career Novelist Prize. Writer in Residence at Forbes Library in Northampton, Massachusetts, she is also an editor and writing coach.